We will now go through the terminal charts. In this topic we will cover how you can view the charts in the chart screen. 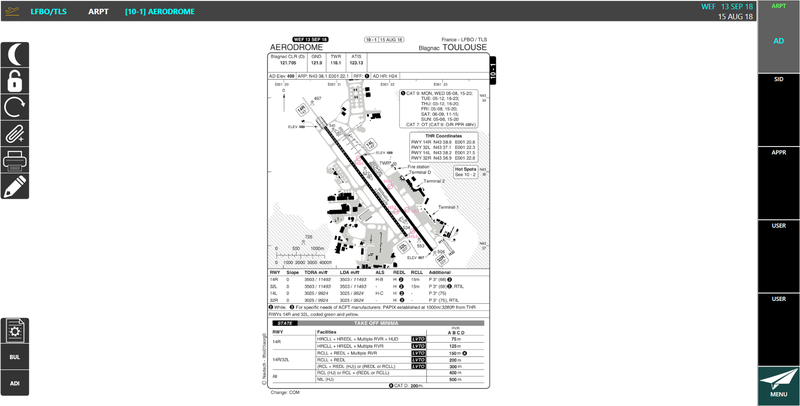 The charts screen will display charts and any supporting information for the specific aerodrome entered in the route toolbar. Let's start by looking at how we can get access and view the charts. One way you can view your charts is by clicking on the menu button. You can now select either your TO, FROM or ALTN aerodrome from the list to access a chart. 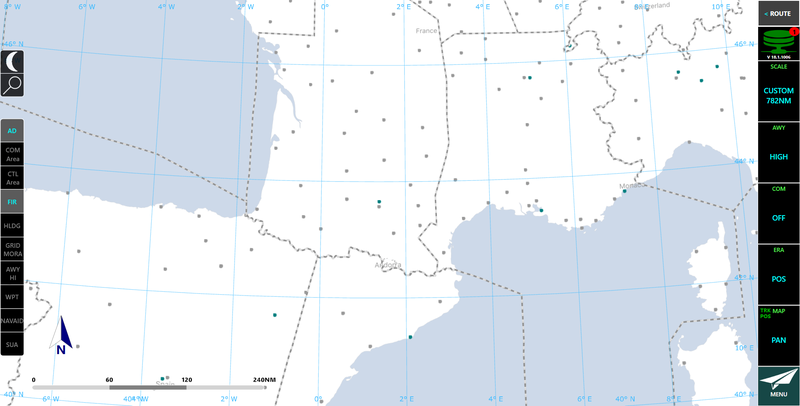 Let's have a look at our FROM aerodrome LFBO chart. Click the LFBO/TLS menu item. You are now in the terminal charts section for LFBO. 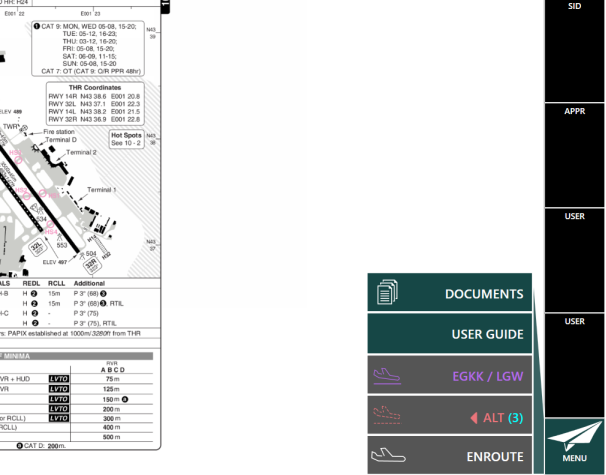 Let's go back to the enroute screen to have a look at another way you can access the charts. Click the Enroute menu item. A route has already been entered in for this example. Let's have a look at LFBO again. Click the Aircraft Icon button. You are now back in the charts screen. Let's now have a look at the chart viewer in more detail. Charts screens feature a chart viewer, this is a tile ribbon with five tiles where your charts can be assigned for quick access. Grey tiles indicate the chart category and title of the chart currently displayed in the terminal chart screen. In this example it is AD chart that is displayed. 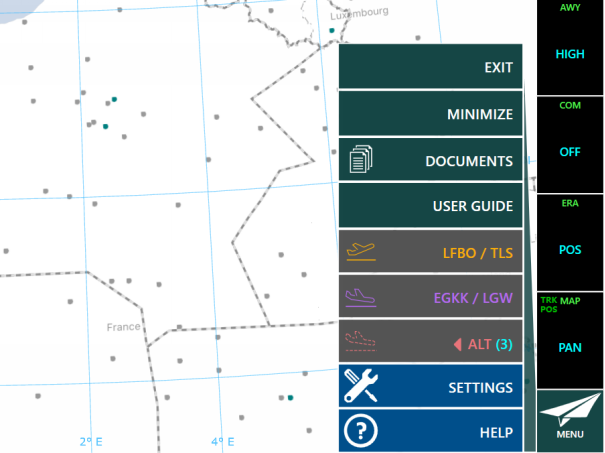 To assign a tile, see assign a chart to ARPT, SID, STAR, APPR or USER Tile. Displayed charts may include an explicit "With Effectivity From " date (WEF). If a chart does not have a WEF date, the charts are available to view on Monday 00:00UTC of its revision week. The charts toolbar. This is explained in a separate topic.